Palm Garden is so proud of our team member– Armen Froojen- because he puts persons before tasks. Looking at the picture above you might think Armen is a piano virtuoso. You might think “what a great picture of a pianist being paid to entertain the guests, residents and family members of Palm Garden Vero Beach. But he’s not. Armen is actually the Assistant Director of Building Maintenance. He just believes there is nothing better he could ever do with his time than to spend it sharing his talent with our treasured elders. See, Armen didn’t always play piano. In fact, it wasn’t until he met a Priest in his parish who was generous with his time. He could see Armen’s hunger to learn and express himself musically. He taught Armen how to play Piano. Armen shares in a most special way. He works super hard all day long– shows up early in fact– to make sure those entrusted to our care have a beautiful and safe environment to heal. 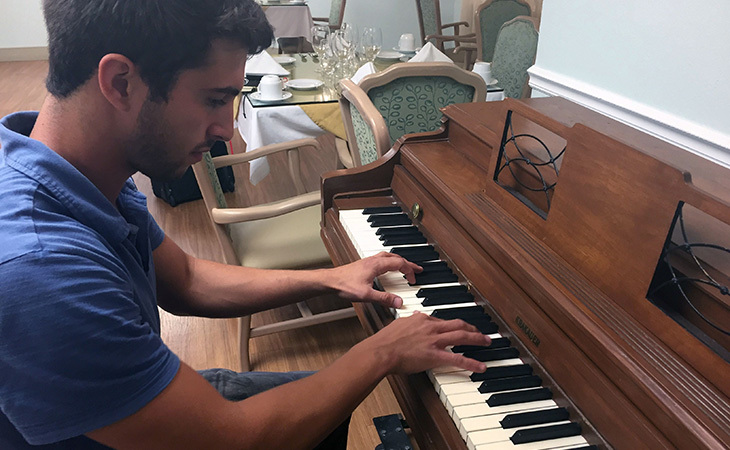 He does all this to make sure he has time to stay late– after work– to play music for our guests, residents and family members. I am responsible for uncompromising levels of cleanliness and creating a safe and accident free environment. I fully understand my role and responsibility in creating this positive experience and seek ways to improve it. We are so proud of our Palm Garden Family Member, Armen Froojen. You are a GEM. You make Palm Garden special.